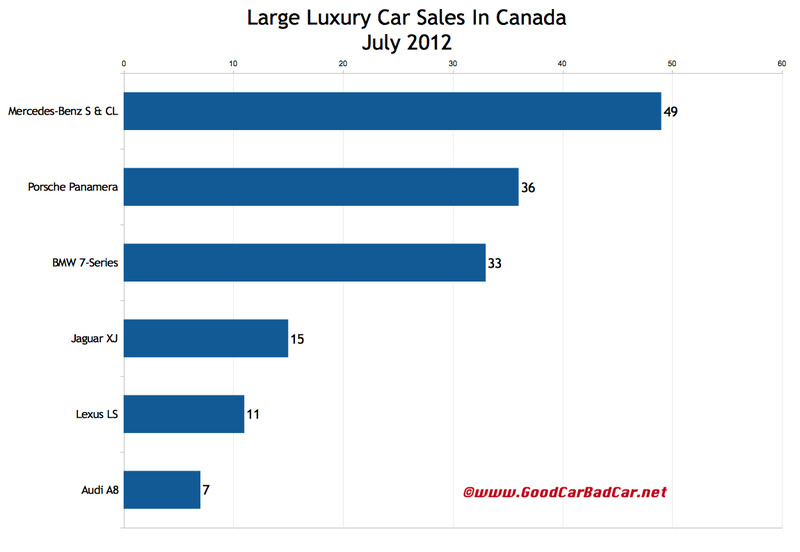 GM Canada sold its first ten Cadillac XTS sedans in July 2012. Hyundai sold 12 Equus sedans during the same 31 days. GoodCarBadCar considers neither of those two cars competitors for the $236,100 Mercedes-Benz S63 AMG, or for its lesser brethren. That’s not to say the XTS isn’t a massive improvement on the DTS. Nor does it mean the Equus isn’t a class act. But they both cost less than a Mercedes-Benz E550 4Matic. So to the subject of the S-Class’s true large luxury car rivals, none sold as frequently as the S-Class (and its CL-Class coupe sibling) in July. Audi A8 sales plunged year-over-year. BMW 7-Series sales dropped sharply. Lexus LS sales were up 83%. You’ll want to put an exclamation point on the end of that percentage symbol. Until you realize that LS sales rose by only five units, that LS sales are down 40% this year, and that Lexus sold only five LS600hL hybrids in the first seven months of 2012. There’s a new LS coming soon. Lexus LX570 sales are also on the rise, to the extent that in this large SUV category, the Lexus is no longer a back-of-the-pack pretending contender. The LX outsold the Infiniti QX56 in July as a result of the QX’s 46% year-over-year decline. Be reminded that historical monthly and yearly sales results for all these vehicles can be accessed, free of charge, through the first dropdown menu at GCBC’s Sales Stats home. 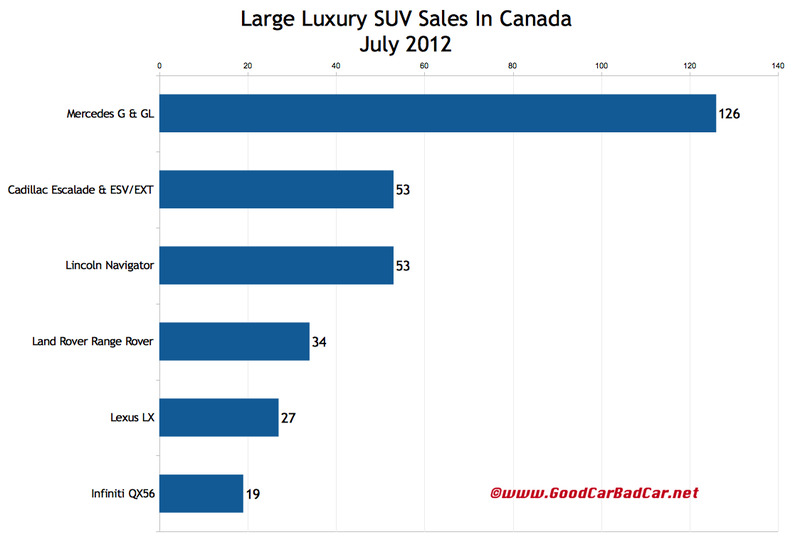 After the jump you’ll find detailed July 2012 and year-to-date sales data for 12 large luxury cars and SUVs. Click either of the accompanying charts for a larger view.